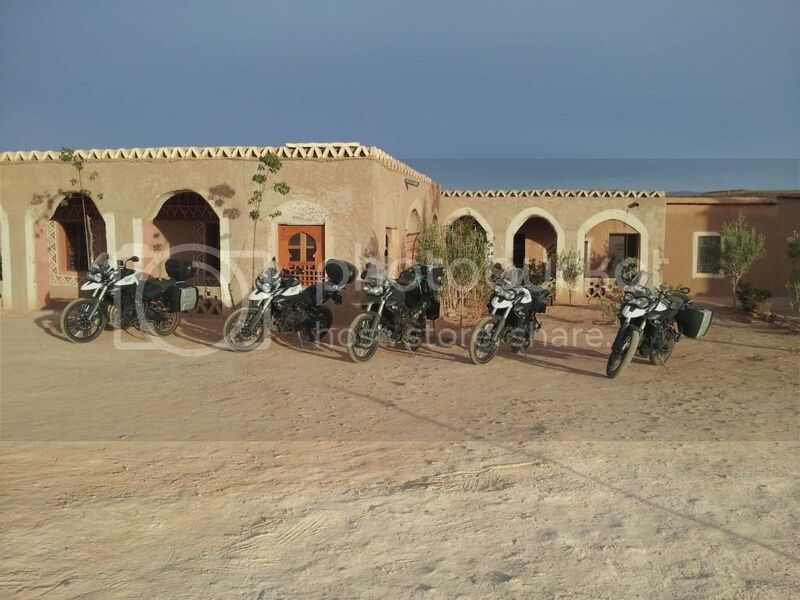 The main business is Tiger 800 XC bike rental, and Anton runs this tour before the start of his rental season and to avoid Easter when Moroccan roads and off road become busier with Spanish motorsport enthusiasts. Anton maintains the bikes to a very high standard; I had new tyres on mine and he uses Galfer brake pads for example. My rental bike had 26000 km on it but rode as smoothly as my own roadie which has done only 7000 km. Full luggage including a top case is offered but I managed with just the panniers, and I rented a Garmin GPS which Anton had programmed with the route. There are various height options on the XCs, with low seats and also a lowered bike available. Due to the timing and Anton's almost unique itinerary, we had kilometre upon kilometre of road to ourselves. We were also very lucky with the weather; if anything it was a little too hot and sunny, but it stayed dry throughout and that made the riding much more pleasant. There was a question on another thread in this section about the experience required. I benefitted from having done an off road skills course, which gave me confidence on some of the looser surfaces, but essentially this is an on road trip with a few rough tracks (and potholes) ideally suited to the Tiger. The pace is set by the group; there is some exhilarating riding but I enjoyed not rushing too much in order to take in the scenery. There are some police radar controls in built up areas where it wouldn't be sensible to be speeding anyway. The average riding day was 340 km with plenty of rest stops for fluids and a lunch stop typically taken at a local roadside restaurant. By design, there was no night riding, which apparently can be dangerous due to lack of lights on some other vehicles. 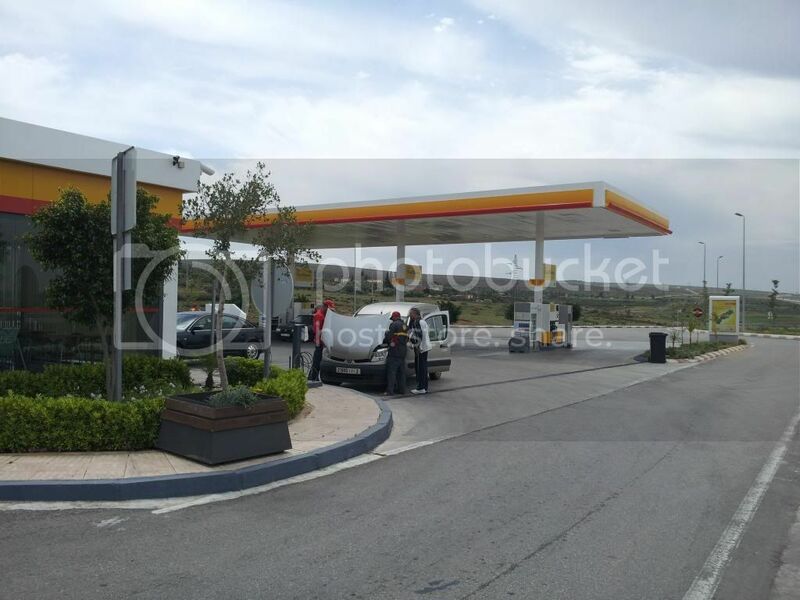 Coincidentally, we were getting at least 340 km on one tank of fuel so on the majority of the days we just had one fuel stop at the start or end of the day, costing around 200 dirhams per tank. With the exception of the arrival into Fès, Moroccan traffic was fine, and the drivers very considerate towards motorcyclists. 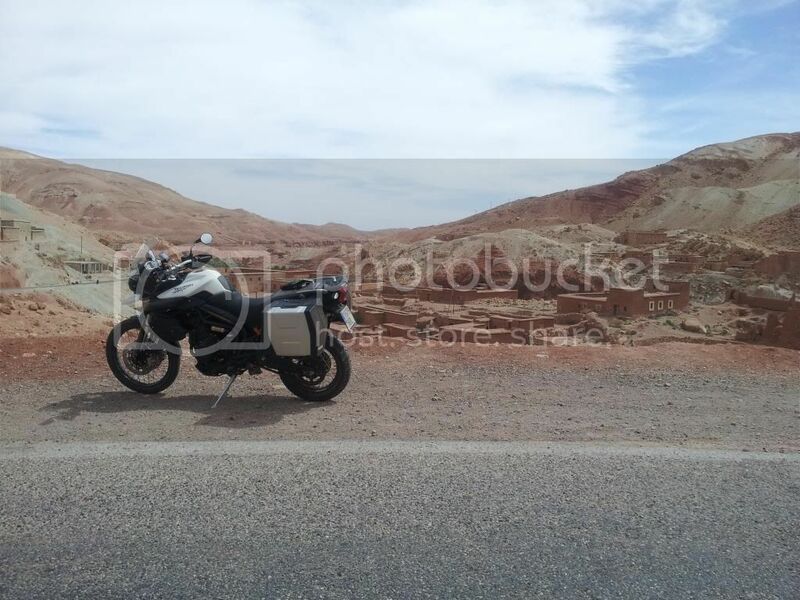 Moroccans are also very friendly and will give a wave when they see tourists on motorbikes. 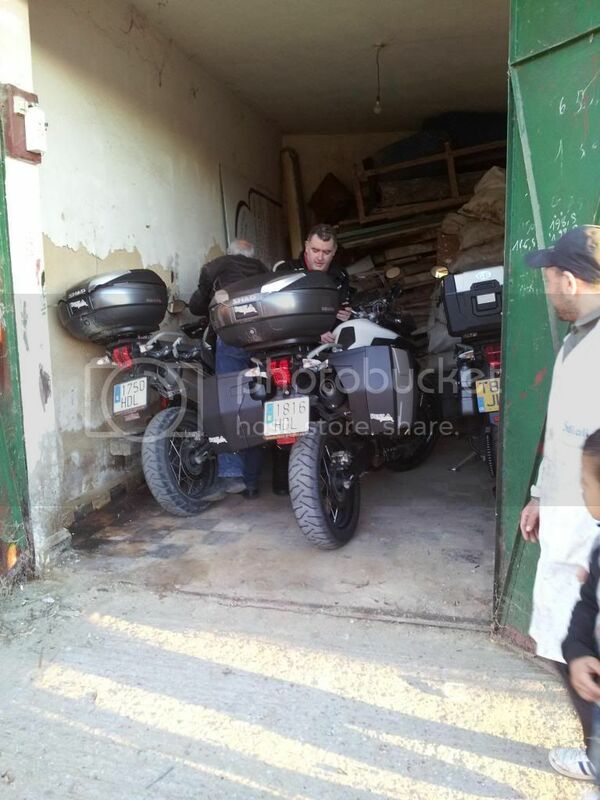 Originally there were meant to be seven bikes (with Anton's wife Ana riding pillion with him). 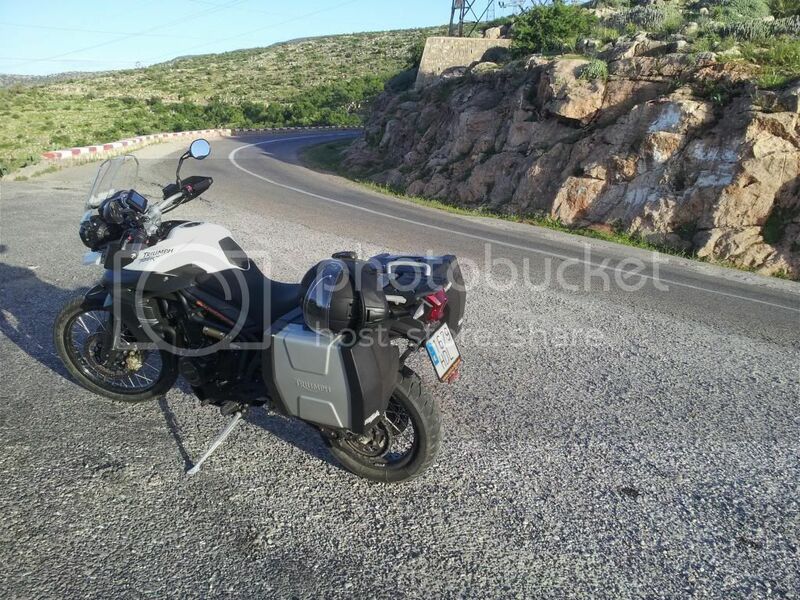 A couple of bikes dropped out before the tour for personal reasons, and with another couple of bikes doing a slightly different itinerary at the start and end, it meant only three bikes leaving and returning to the starting point at Málaga. 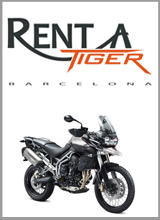 John had ridden from the UK on his own Tiger, and Anton had brought his Tiger and my rental Tiger down from Barcelona on a trailer. The two others (Canadians John and Dennis) doing the variation had ridden rental Tigers down through Spain from Anton's base and we met up with them at Volubilis before Moulay Idriss on the first day. Anton had preprogrammed their satnav and the meet up went very smoothly. It’s worth saying that Anton is extremely flexible and with his travel industry experience and contacts will go out of his way to accommodate alternatives. Evening meet up at seafront hotel in Málaga. This was the longest day in terms of distance at 420 km and also included the short ferry crossing from Algeciras to Ceuta. Moroccan customs was not too bad, the worst problem being getting used to the heat whilst standing around. The system is slightly convoluted; one booth to get passport stamps including a CIN number, a second booth for the bike temporary import paperwork, then a signature from the chief official. Anton prepares all the paperwork in advance and handles all this with ease, and we were lucky that it was not too busy. We ended the day in Moulay Idriss, which as a pilgrimage destination has the most basic accommodation of the trip. We put the five Tigers into a lockup for the night and enjoyed our first Moroccan evening meal. Another quite long day at 406 km, with the highlight being a ride through a cedar forest (and finding snow) and finishing at a well appointed lakeside hotel at Bin el Ouidane, complete with rather refreshing outdoor pool. 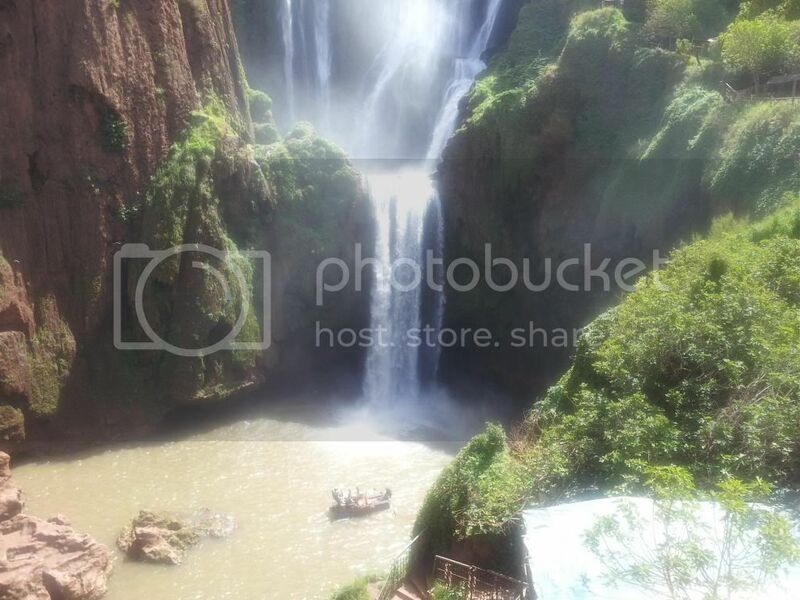 A short day at 234 km gave time for a visit to the beautiful waterfalls at Ouzoud. 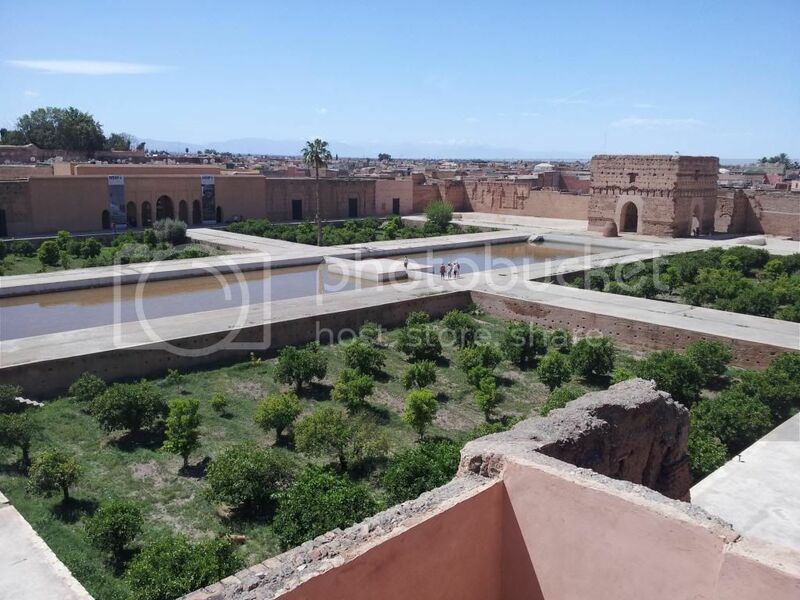 The ride into Marrakech was not too bad; Anton had chosen a riad to stay in with good access and a large garage. And it had a small pool in the courtyard which gave another opportunity to cool off. There was an optional ride to Essaouira on the coast, but nobody fancied a long highway journey and after the heat of the previous three days, a rest day was a sensible option. John and I wandered around Marrakech and also jumped on a tourist bus for a rather uninspiring trip through the outskirts of the city. Four of us ate out in the evening and took a ride back to the riad in a three wheeler taxi through the medina (and it is barely wide enough for a donkey the way we went). A ride of 312 km took us to Agoulzi through the Valley of the Roses (not really in season though), after crossing the High Atlas via the Tizi-n-Tichka pass. There was a rough track for the final climb up to an eco lodge where we stayed. A perfect location with a beautiful sunset. 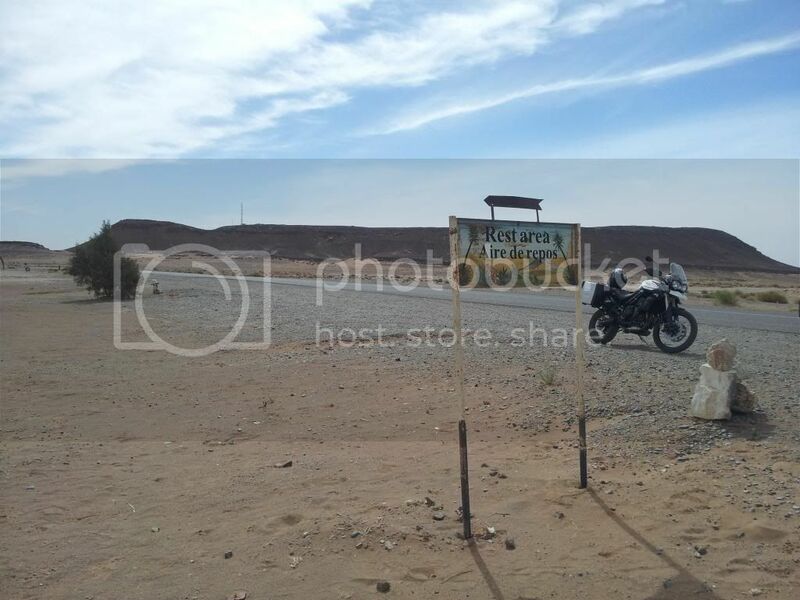 After 343 km we arrived at the hotel on the edge of the sand dunes at Erg Chebbi, the last few kilometres being ridden along a dusty track having turned off the main road. On the way we had made a slight detour to ride up and down the switchbacks of the Dadès Gorges; not at speed though as you really can't see what is coming around the corners and the edge of the road feathers away into gravel in places leaving little margin. 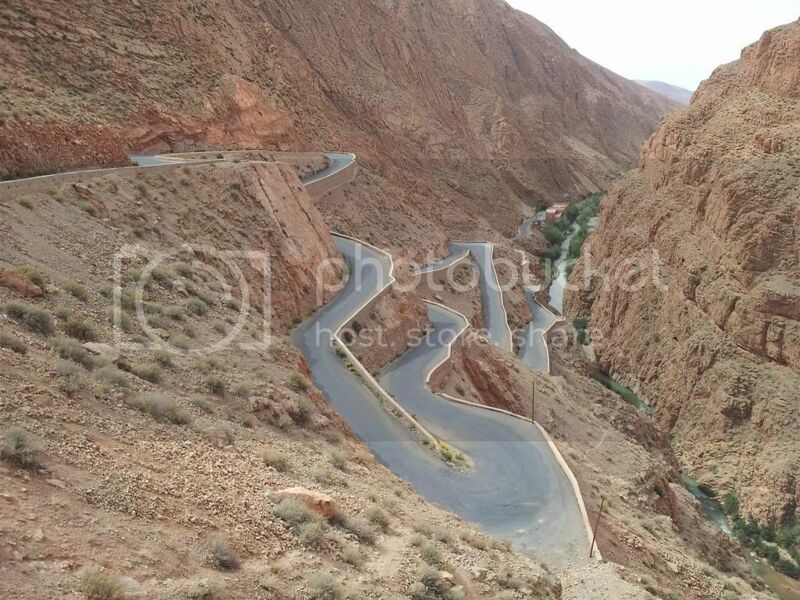 This day and the next in the Mid Atlas were something special, with scenery and road terrain to really be savoured. The Amellago Gorges is spectacular and we ended the day in the chill air of Imilchil after 336 km. We took a little used road from Imilchil which gave a real sense of adventure, partly due to the road falling away into the river in places. We stopped for lunch in Zeida at a typical roadside barbeque, then at Ifrane for afternoon tea (and what a contrast), then had the congested ride into Fès to finish the day at 334 km. As a lot of the last day in Morocco is on highways heading north to the coast, we had time for a guided tour around the city (included in the price of the holiday), then set off to take a toll road. The ticket barrier wouldn’t trigger with just one bike, but two bikes side by side would do it, and a helpful car driver nudged the last bike through. After 323 km, we ended up in Melilla having crossed the border without delay, and we passed the time waiting for the ferry sitting outside a seafood restaurant. This was the first time in the trip I put a fleece on, as it was much cooler on the coast than what we had experienced the previous days. The ferry was very comfortable, with a cabin and shower, and I could barely notice it moving. In the morning, we rode off the ferry and towards the hotel nearby for me to drop the bike off and pick up the bag I had left. 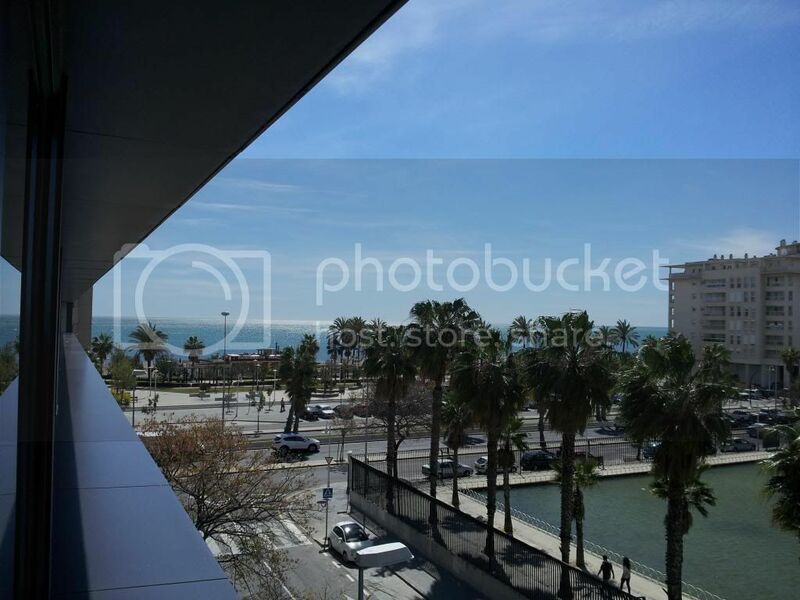 I had a flight to catch from Málaga airport, but in the event I had plenty of time, as Anton had chosen a hotel located both close to and between the port and the airport. All in all, an amazing trip. 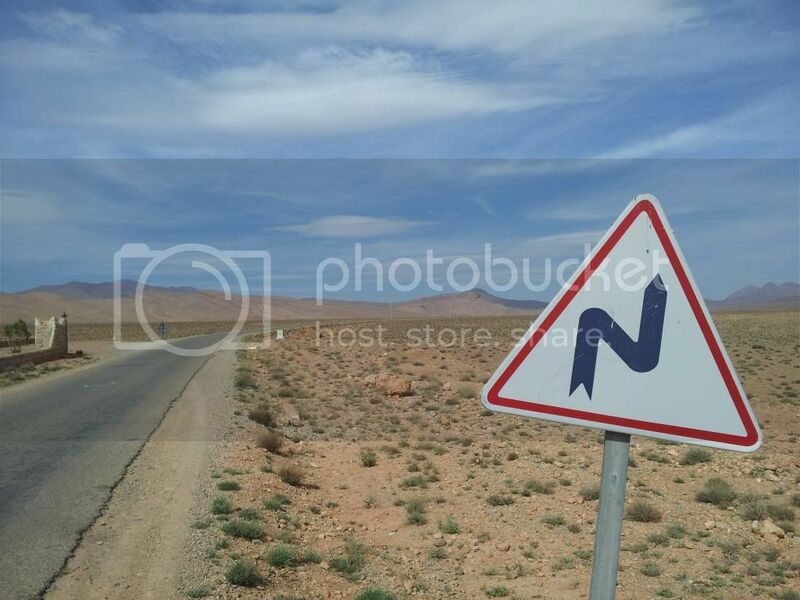 Morocco is a fantastic country and for me provided a perfect introduction to motorcycle touring with a nice sense of adventure. Anton’s organisation meant that one could just enjoy the riding without worrying about anything else (apart from me nearly running out of fuel but that is another story). Great report guiri, really fancy this next year. Spent 5 days in Marrakech 2 years ago - loved the culture / people. Just need to convince the wife its a good idea. Thank you Guiri for doing the ride report, I can only echo your comments and reiterate what a great time we had. Thank you Anton and Ana for showing us the best of Morocco.